Four weeks ago the new shoots just had the lengths of a handspan. Now the wireframes are filled to the top with strong green and berries have almost reached the size of peas. Watching that quick growth is breathtaking year after year. The main event since the last post has been bloom. And due to all the sunshine I’d say that went really well. Most grapes carry all the berries they are supposed to. With all the heat and sunshine Peronospora hasn’t been a problem this year. It’s more Oidium weather but so far we don’t see any infections. Of course there is never enough time to do things as well as I want to in every vineyard. As soon as green-pruning is finished we rush from vineyard to vineyard to get all the shoots between the wires and remove suckers, watersprouts and side shoots. 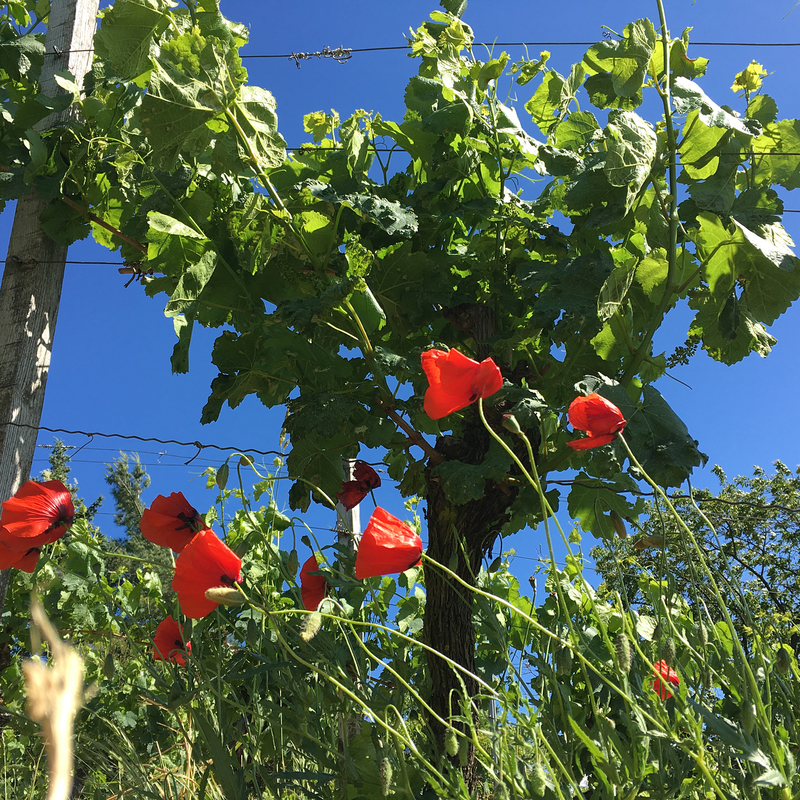 Two Silvaner plots are particularly nasty – it’s the clones – but now they’ve been done twice this season and that should be about it. In an ideal world all shoots would be organized as perfectly as on the picture showing the Silvaner we use for our Pet-Nat. Of course they aren’t. Because they’re often growing in weird directions or the wind decides to reorganize the order. Sometimes it’s fight against windmills. An airy grape zone is crucial for having healthy grapes in the end so it’s worth every single hour of work. And of course the last weeks it was time for more lambs! All sheep have had their babies. You might remember that the sheep had to leave the vineyard after the shoots came out but I let them back in 2 weeks ago and so the last lamb was born right in the vineyard. The only thing I can complain about currently is the lack of rain. But Thursday looks like we’re going to get a good amount – fingers crossed!